Lewis Hamilton effectively wrote off his chances of winning the drivers' world championship after finishing fourth in the Brazilian Grand Prix. The result leaves the McLaren driver 24 points behind leader Fernando Alonso with one race remaining. He is also 16 points behind Mark Webber, in second, and nine points behind Sebastian Vettel in third. 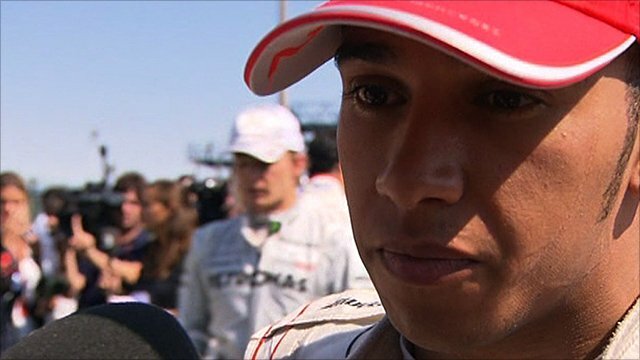 Hamilton told the BBC: "If we're not quick enough here, we won't be quick enough in Abu Dhabi." With 25 points available for a race win Hamilton can still mathematically take the championship, but would need Alonso to finish out of the points and Webber and Vettel to secure a minimal return. "There's not too much to say, I was nowhere, I had no grip," said Hamilton after Sunday's race. "The car just didn't feel like it did in practice. Down the straights in particular I didn't feel the 'F Duct' [aerodynamic device] was working, I was struggling to overtake backmarkers and Fernando just shot past me. "You can' t win with a car that isn't fast enough. Right now we just have to focus on getting points for the constructors' championship." Hamilton's team-mate Jenson Button finished fifth in Sao Paolo, and his slim chances of retaining his drivers' crown are now over. "I won the drivers' world championship in Brazil last year [with Brawn], and I lost it here this year, but all in all, it's been a pretty good season," said Button. "It was a learning year, and good practice for next year: I firmly believe we can really build on this for the 2011 season. "Lewis can still win the drivers' world championship - but the top three drivers will have to fare badly for it to happen, so I guess it'll be difficult for him. "I'm out of it now, so I'll treat the final race much as I treated this one: I'll just have fun and try to enjoy it." McLaren team principal Martin Whitmarsh praised Button's contribution over the season. "Jenson lost the chance of retaining his drivers' world championship this afternoon, but he's been a superb team player all year and has made a great start to his McLaren career. "Lewis is one of four drivers who are still in contention for this year's drivers' world championship - and, although he faces a very tough task in order to prevail, he'll definitely be giving it everything he's got in Abu Dhabi in his efforts to become world champion for the second time in his career. "Good fortune will have to play its part, and nothing short of a win will suffice, but it's by no means impossible."